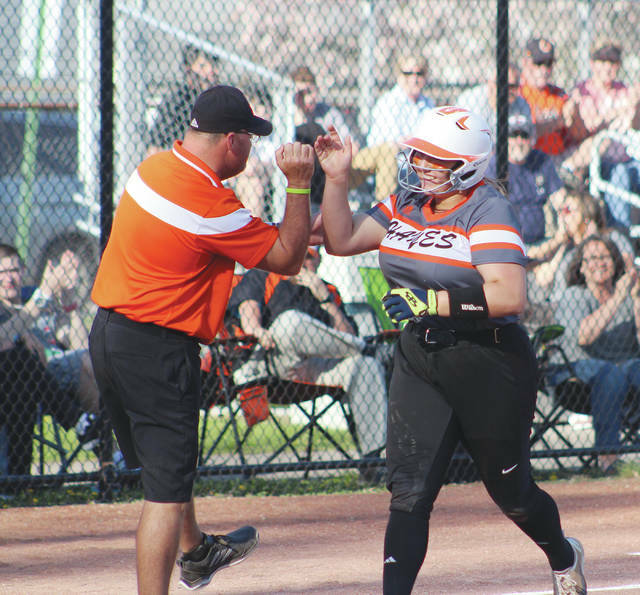 Hayes’ Liaiha Slayton high fives head coach Mark Thomas as she heads for home after hitting a homer in the third inning of Tuesday’s OCC showdown against visiting Hilliard Darby. The Delaware Hayes softball team pounded out 13 hits, including home runs by Mallory Stonebraker, Liaiha Slayton and Alex Armstrong in a convincing 11-1 victory in five innings over OCC-Cardinal-leading Hilliard Darby Tuesday in Delaware. Bobbi Adams went a perfect 3-for-3 at the plate, including a two-run single as part of a three-run first to put the Pacers, who have won seven straight, ahead to stay. She was battery-mate to Haley Osborne, who went the distance for the win the circle. Osborne allowed three hits over the first four innings and finished with three strikeouts for the game. Osborne’s only hiccup came in the fifth inning when a two-out RBI double by Tegan Cortelletti got the Panthers on the board. By that point, the Pacers had blown it open. Slayton, who led off the third with a home run, doubled in a run with two outs in the fourth. The next batter, Stonebraker, provided the big blow with a three-run shot to left-center. Audrey Hannahs capped the five-run frame with a RBI single. Armstrong’s two-run homer in the fifth ended it early. Hayes had its opportunities early – stranding the bases loaded in the first inning before having a runner thrown out at the plate to end the second. The Pacers had a four-run lead when Hilliard Bradley scored eight runs in the sixth in a 10-5 loss Apr. 10. They had a 3-0 lead at Darby Apr. 18, but the Panthers took advantage of a couple of errors in a four-run third in handing Hayes its second loss. This time – the Pacers responded with the eight runs scored after the early adversity. Oh, and they committed no errors. Hayes needs to win at Dublin Scioto in its league finale Thursday to have any shot at a piece of the conference crown. But the Pacers also have to wait and watch. They’ll be watching Hilliard. If Bradley sweeps Hilliard Darby or the two split with each other over the next two days, the Pacers share the title. Hayes shares with the Jaguars in the first scenario or the Panthers in the second. Darby will win the title outright if it sweeps Bradley. Adams led the Pacers (15-2, 9-2) with three hits, followed by Slayton, Stonebraker and Amaia Daniel with two apiece. Stonebraker drove in three runs to lead the way with Slayton, Adams and Armstrong adding a pair of RBI each. Chloe Barton reached twice on walks and a third time on a hit and scored a team-high three runs and Armstrong scored twice. Cortelletti led the Panthers (13-5, 9-1) with a pair of hits. Maddi Clark took the loss in the circle, allowing six runs (four earned) on six hits and three walks over 2.1 innings. The Pacers host West Jefferson in non-league next. The two meet today at 5:15 p.m.